Watching Durham Bulls Baseball: A Win! Both the wrap and the Courier-Journal stories laud the performance of Durham Bulls outfielder Dayron Varona. Wish that I’d seen the plays. Worth a read. Jamie Schultz had a great start. His game score of 72 was the best of any Durham starting pitcher since his own 71 back on April 24th. He only let up 2 hits and threw 6 K’s over 6 innings. Guess we aren’t the only ones upset about home field losses. Check out the Courier-Journal link. Seems that the Bats aren’t doing good at home either. I like the Game Score stat as a way of looking at starting pitchers and, in context, it gives some indication of the importance of starting pitching. Here are the scores of the last 15 games. The circled scores are the anomalies. 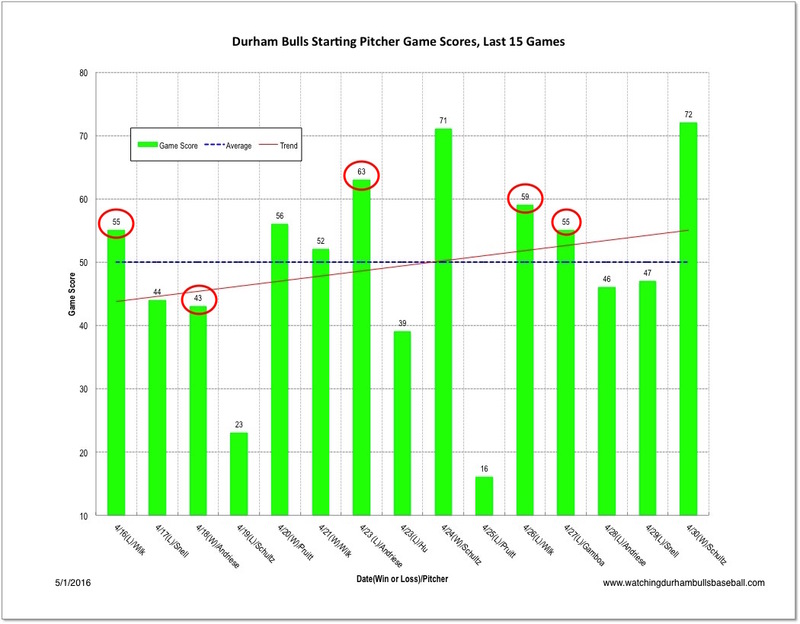 They mark scores that were above average, yet the Bulls lost (4 of them) or below average, yet the Bulls won.